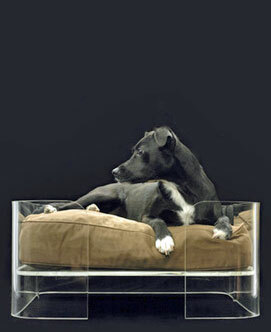 When it comes to choosing dog beds, it's best to get it right first time. Don't just pick up the first one you see, you'll only end up wasting money. Instead, take your time and consider the points below to make sure you choose the right one for your Cocker Spaniel, after all he's going to spend an awful long time in it! Too Many Dog Beds To Choose From! Nowadays there are just so many different types of pet beds to choose from. From designer beds for those owners who want something very special, to very simple cushions or pillow type beds for those who're not so fussy and perhaps more concerned with comfort and practicality than design! And they come in all sizes, shapes, colors, and materials! 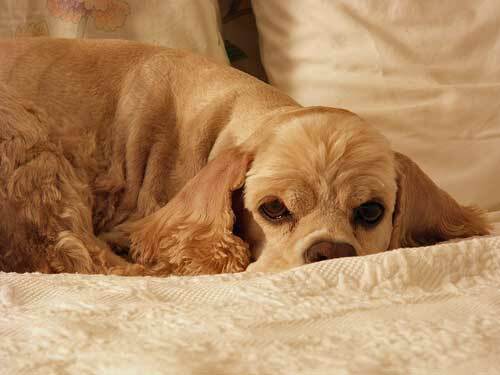 Your Cocker Spaniel will probably spend a long time in his bed so it's wise to choose one that will not only help keep him warm, cozy, and comfortable, but one that will be the right size for him too - make sure it's up to the job. Size is important, so let's take a look at how we can make sure we buy the right size dog bed for our pampered pooch! Most dogs curl up before going to sleep and would happily sleep in that position all night. Others however, like to lie on their back fully stretched or on their side, legs stretched out in front of them. For a comfortable night's sleep, your pet needs to be able to stretch out fully (should he wish) without resorting to hanging his body or his head over the edge of the bed. Whatever position your Cocker sleeps in, his bed needs to be big enough to accommodate his entire head and body so it's really important to buy the right size. To do this, simply measure from the tip of his nose to the base of his tail and then add 30 cm (12") for comfort - that should do it! If your Cocker Spaniel is getting on in years, he may benefit from a specialist dog bed for older or arthritic dogs. 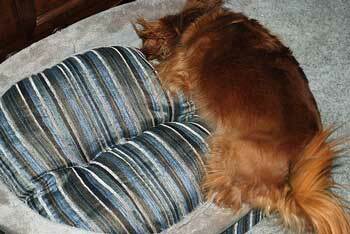 An orthopedic bed can help to support and cushion his old bones and arthritic joints. There is a selection of orthopedic beds available with pillows that can be gently warmed in the microwave - neat! To keep him cool in the summer, you can also buy a gel pad that you can either freeze or put in the refrigerator and then place under the cushion in his bed. 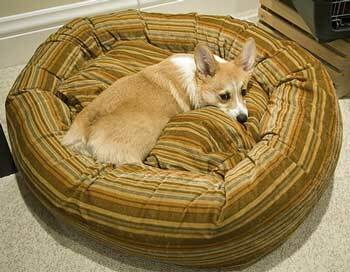 If your pet likes to snuggle down on a cushion, he may prefer the circular or square pillow-type beds. If your house is drafty, you may want to consider the nest type which has raised edges on three sides, and will protect your dog from any cold drafts. Your Cocker Spaniel will feel more protected in a bed with sides and will often rest his muzzle on the raised edge or use it as a pillow! If his sleeping area is prone to dampness, you may like to consider the plastic bed with a soft pillow or cushion insert - dog crates are ideal for keeping out the damp. It's also worth noting that some soft beds have a waterproof underside too. You dog's bed should be easily machine-washable to allow you to keep it clean and bacteria-free. Would you be happy washing your dog's bed by hand every week? No. I didn't think so! Unfortunately, when I bought Max's first bed, I didn't get it quite right. Although the main bed itself was washable on a gentle wash cycle, the pillow insert wasn't - which I've since discovered is very often the case. The first time the pillow was washed the filling clumped together into one solid ball rendering the pillow totally unusable. Rather than throw it away I resolved the problem by unpicking some of the stitching at one end of the pillow, removing the lump of filling and replacing it with (washable) bean bag filling (fire retardant of course!). His bed is as good as new and it's now more comfortable than ever! Max squirms around on it until he gets it into the shape he wants, before settling down with a contented sigh! Because the price of dog beds can vary quite considerably, from basic pillows to designer beds, I recommend that you decide how much you can afford to spend and then research the market fully to make sure you get the best price.